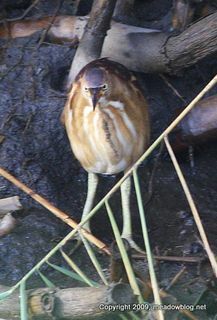 At 4:45 p.m. Thursday, we had a trifecta on the Marsh Discovery Trail on the Boardwalk at the place where everyone has been seeing the Soras and many have seen the Least Bittern. First we had two Soras, then the Least Bittern, then a mature bald Eagle flew almost overhead. Not a bad way to end September. Hoping to get a photo of the Bald Eagle to post as well. Birder Don Torino did a quick walk at Mill Creek Marsh in Secaucus yesterday. He had Savannah Sparrows, Palm and Yellow Warblers, two Berlted Kingfishers, an Eastern Phoebe and a beautiful Red Fox walking along the trail. When we were kayaking in the Kearny marsh last week, we saw many great examples of nature on the rebo und. Now that the Meadowlands Commission has spent tens of millions of dollars to overhaul the old Keegan Landfill, leachate no longer seeps into the marsh, and catch-and-release fishing is thriving. The fish are not safe to eat yet, but they are another indication that the marsh –and the Meadowlands are coming back strong. We watched as the gentleman who caught this fish gently released it back into the marsh. 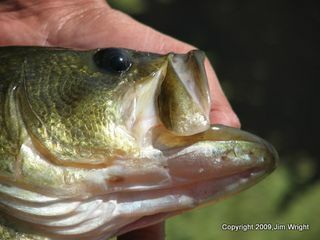 We also saw another angler broke his reel when he tried to catch one of these big boys — the old "one that got away." Because of the recent rains and strong winds, there's some water collecting in the main impoundment at DeKorte Park again, and many of the birds are hunkered down next to the phrags. Birds of note seen on a quick tour today include Soras (2) along the Marsh Discovery Trail, a few Pectoral Sandpipers, a Black-Bellied Plover, a Black-crowned Night Heron, a Peregrine Falcon and Osprey. The Immature Little Blue Heron was seen yesterday. Did not see it today but was not really looking. 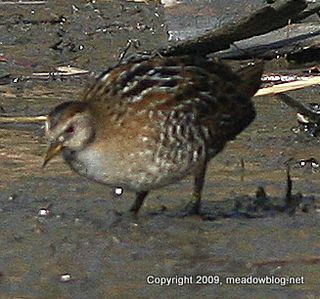 Birders desperately seeking Soras can e-mail Jim Wright here. 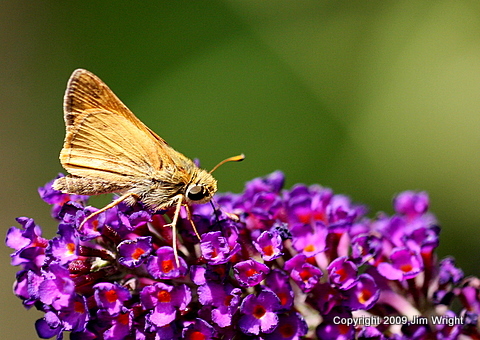 Bruce Riede of Ridgefield took this shot in the Ridgefield Community Garden earlier month. We are thinking it might be a Willow or Alder Flycatcher. Any thoughts? 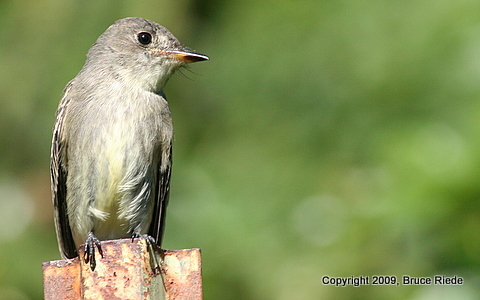 Click here for more on Willow Flycatchers. This weekend looks to be a great one at DeKorte. On Saturday, the Meadowlands Environment Center presents “Butterflies Everywhere!,” an educational program featuring butterfly farmer Rick Mikula and his live and collected specimens of these beautiful creatures. Appropriate for anyone over age 5, the program is $4 for MEC members and $5 for the general public. 1 p.m. start time. For more information, call 201-460-8300. On Sunday, there's a free twin bill — the First-Sunday-of-the month Bird Walk with Bergen County Audubon Society at 10 a.m., followed by a talk and reading by the author of the new book "Salt Marshes." The walk starts outside the Meadowlands Environment Center and runs roughly 90 minutes. 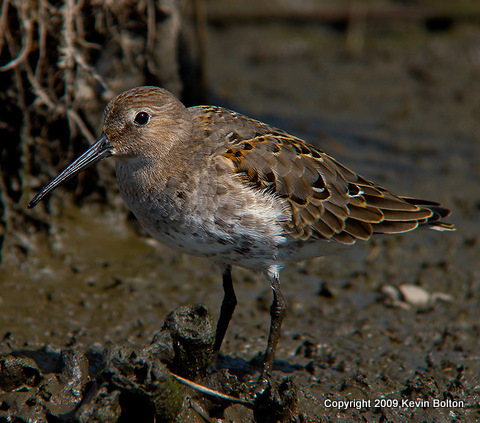 We will look for shorebirds, waders, Ospreys and migrants. Meet in front of the Meadowlands Environment Center. To rsvp, contact Don Torino of the BCAS at greatauk4@aol.com or 201-636-4022. At noon, Rutgers biology professor Judith Weis will present her new book “Salt Marshes: A Natural and Unnatural History” at the Meadowlands Environment Center. Weis, an expert on “recovering” marsh’s like those surrounding the Hackensack River, and the critters that live in them, will discuss the critical importance of these ecosystems and how, for too long, they have been used as dumping grounds. The talk is sponsored by the New Jersey Meadowlands Commission as part of its 40th Anniversary Celebration. For more information, call 201-777-4600 or visit the “Events and Alerts” section at www.njmeadowlands.gov. We now have the rules and the forms on one download. We'd love to see your photographs! Birder Andrew Block filed a comprehensive report after 4.5 hours of birding at DeKorte Park for Friday — it provides a good idea of the variety of birds at DeKorte these days, what with the continuing lowered water levels. The list ranges from a Little Blue Heron to a (still on the loose despite repeated efforts) escaped/released Cockatiel. Click "Continue reading …" for the full report. Notes: The egret numbers are actual counts and not guesstimates. One of the adult Soras was very aggressive towards and chased off the Immy. 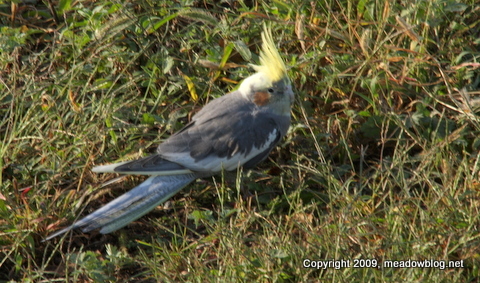 Thanks to all the folks who reported a released/escaped Cockatiel on the Transco Trail. If you are missing a cockatiel, come on down to DeKorte.